Sorry for not posting in nearly a WEEK! I ended up taking a mini hiatus for a few reason. Number 1 because I've been working a lot, and as my department deals with Clearing it's been the busiest few days of the year. And Number 2 is that unfortunately I haven't been very well. Every now and then I get migraines, and sitting in front of a computer for eight hours a day hasn't been helping. But I took a few days off, and have began wearing my glasses again (not much help - note to self: Get to Specsavers instead of shopping) so I'm feeling better. I have been to a few events with my blogger partner in crime, Rachel. I reckon this is going to be part one of two. The first was a Victory Day event a few weeks ago now. Ran by a little company called The Next Big Event (and the SWEETEST girls ever!) who host 'Pop Up Events' around the North East, they have themed nights where they turn a venue into a makeshift venue. Past events have even included a Twilight theme, but this was a 1940s Victory celebration. My mother is half-Italian, and I'm so proud of my Italian heritage. My sister has a lot of her genes from that side of the family - with her thick curly dark hair, large blue eyes and dark eyebrows. I have the matronly bosom and wide hips a lot of my Aunties have. In WW2, because Britain was at war with Italy, my Grandma's family got uprooted from their family home in Jarrow, and had to move into the bedroom of an Auntie, thirty miles away in Bishop Aukland. As my Grandma was the oldest sibling, she had to look after her family as well as working in the amuitions factory (where, as my mam always bring up, she had a scar on her hand when a shell exploded on her. Her glasses were also smashed, but thankfully her eyes were unharmed). I was worried it would be a little disrespectful of me to go to an event like this, when the Italian side of my family suffered so much during the war, through nothing they had done themselves. But the end of the war symbolised a new beginning, as it was supposably the war to end all wars. So it's pretty important to remember this as a time of jubilation. The day was split into two seperate events - the first being a tea party with vintage china which belonged to Hannah and Sarah's (The lovely twin sisters who run the company) grandmother, as well as finger sandwiches and delicious cakes. 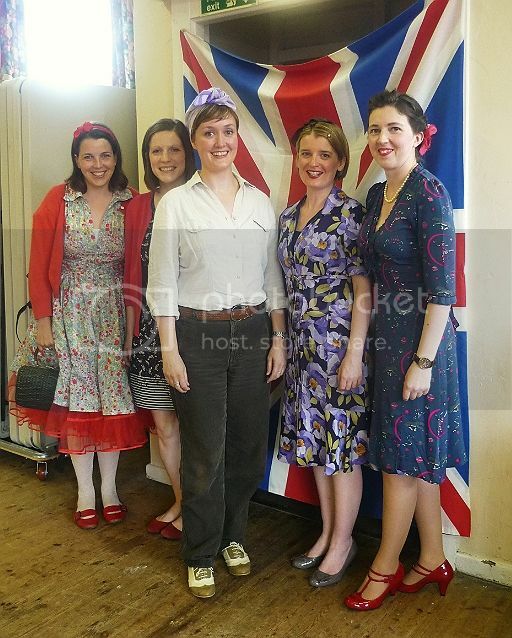 The land girl in the centre won the prize for best outfit (well deserved). Her prize an onion - a luxury in wartime Britain as we stopped growing them in lieu of vegetables such as potatoes which would go further in rationing. In between the events, me and Rachel nipped into Newcastle for a very unladylike cold pint. Sorry you can't see all of it! I wanted a vintage-style do, but as my hair is quite short and I have a heavy fringe my options were rather limited. 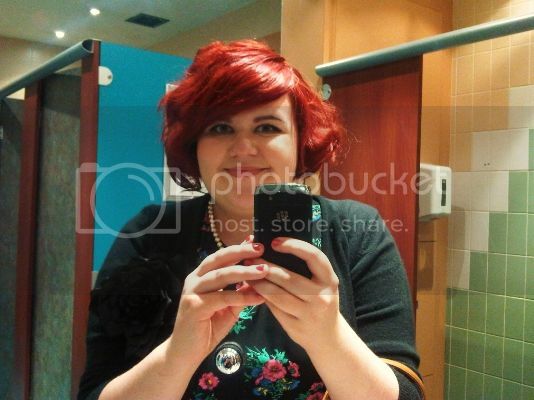 Also with my bright red hair I was never going to look 10o% authentic! So instead, even though I was due a haircut, I gave it an extra two weeks and put in pin curls overnight. The next morning I brushed them out, pinned the longest parts of my hair at the front at the back, and sprayed everything in place. I think it's quite good for a first attempt. The next event was a Rationing Dinner - as the title suggests, all the food was made only using ingredients that were available during rationing. For starter I had potted crab with pickled cabbage. Pudding was a very british strawberry trifle. All absolutely delicious - hats off to Sarah the chef! 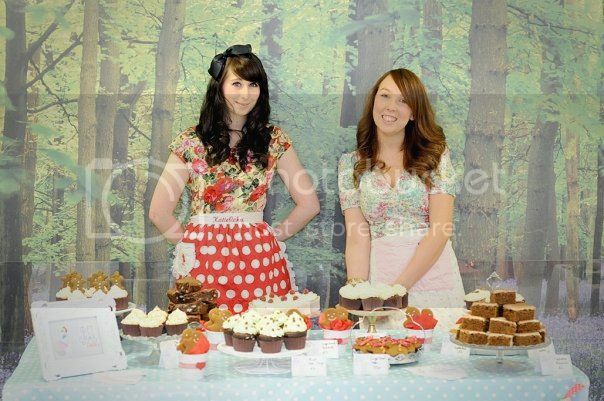 I was so happy that we got sat next to Kay and Katie who run the local Cupcake company Pet Lamb Patisserie. I'd heard of them through the (now defunct) burlesque night Jeepers Peepers, so it was lovely to meet them! They were so sweet, and when I finish my job I think I'm going to order a big box of their baked goods to the office! Be sure to check out Katie's food blog, Katie Cakes. Nom nom nom. As a surprise, The Next Big Event had also arranged local dancers The Swung Eight to teach us how to Lindy Hop. I have two left feet, and was rather appauling - but I still had a lovely time, and the guy I got partnered with Neil was a proper gentleman. I used to be in a swing band at school (2nd saxophone) so it was nice to learn some of the moves instead of being stuck behind a music sheet. A marvellous night was had. Sometimes I really wish I was young during this time in history as I much prefer events like this, than a disgusting sweaty club where (as a lovely guy in an RAF uniform called Andrew pointed out) "People don't even dance anymore, they just grind!" You can see more pictures from The Next Big Event's website. Thank goodness there's only one picture of me dancing. I look like a deer in headlights though, teehee. And thus ends Part One. Part Two is all about the British Style Bloggers meetup yesterday, so stay tuned for that. The menu sounds delish, and those cupcakes look amazing. Cute hair, I love pin curls. This would be amazing if they had one of these in the South... Do you know if they do at all? I think the second World War is the period of history I am most interested in, I think mostly because my Grandad was a navigator in the RAF and I am always fascinated by his many stories. Ahh it looks so amazing! Your hair looks great too, I should really try pincurls out. I do love the 40s style. polkadotrainbows: Thank you, it was fabulous. There's quite a few events like this in London, but not the North where I'm from, so it was a lovely refreshing change. It was great event really enjoyed it, meaning to get along to Swing Tyne since but being foiled at each attempt. It was great to meet everyone too. I wrote a review for Good Food North East, http://www.goodfoodnortheast.co.uk/nextbigevent.html, check the site out for that and reviews of other restaurants in the North East. Might get along to another Next Big Event soon - the evening Soiree and the Christmas event look great! What's In A Name? - The BEST Name Necklaces! 450 Followers Giveaway - WINNERS ANNOUNCED! !